There are things here that make Marty cry a lot on occasion. Wednesday, 25 August, was one of those occasions. 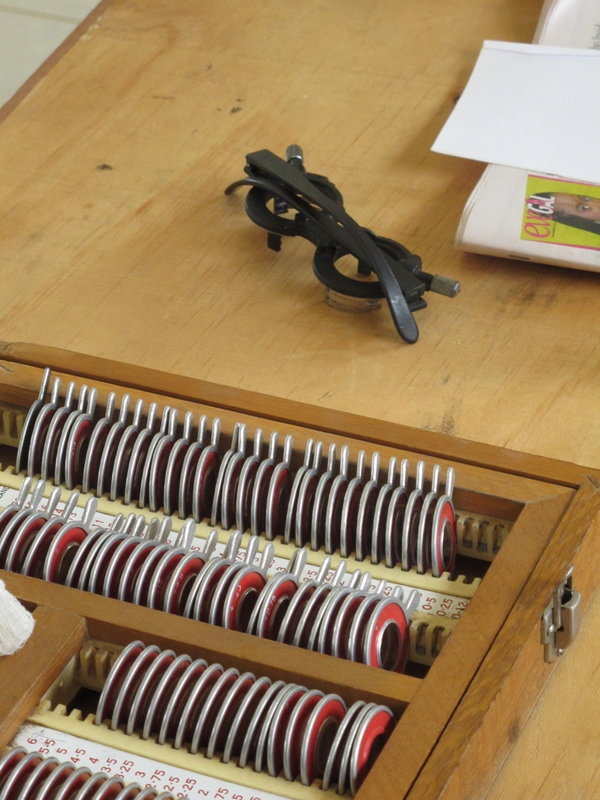 We were given £292 to be used for medical purposes and and additional $100 from a nurse for what we saw fit. 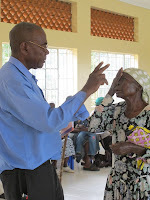 Last year we became aware of some serious eye afflictions in the village and decided that we would use these funds for an eye clinic to treat as many as we could. 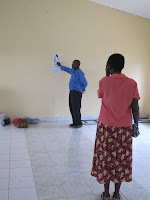 So - Hesbone arranged for two eye specialists (one a surgeon) and a medical secretary/assistant, plus a retired nurse who is a member of the church to set up a clinic in RCC - the church. The two professionals were paid a nominal fee. We also purchased medicine that was dispensed on the spot. THIS WAS THE FIRST EYE CLINIC EVER HELD IN THE VILLAGE. The clinic was to be held for three hours, but went longer so that everyone of the 120 people could be seen. At the end of the day 73 people were treated for various infections - one little boy had such a serious infection in his eyes that puss was coming from them. Medication will heal them. 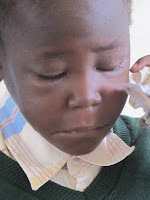 Nineteen will receive surgery - 14 of them cataracts - including an 11-year-old boy (some both eyes), several with foreign objects to be removed and one little eight-year-old girl, Mary, with a corneal adhesion. As it turns out, if surgery isn't done while she is still eight, the damage will be permanent and she will be blind in that eye. The surgery is very simple. Thanks to supporters this little girls life will changed and she will have normal eye sight. 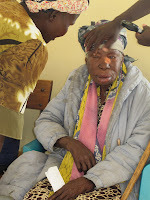 Lorna - a widow in her 80s - is seriously visually impaired. She walked to the clinic - the light hurts her eyes so badly that she drapes a cloth over her head to let in as little light as possible. The doctor said he doesn't know how she could see to get there. He said that a simple operation to remove severe cataracts will restore her sight. We hope to be here when she has the surgery so we can see her face when they remove the bandages and she can see. 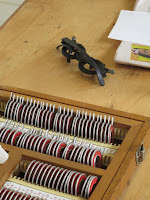 The equipment was not what we in the West are accustomed to seeing, and the eye-chart test was simple - sometimes not needed as the technician would hold up one or two fingers in front of a person with serious visual impairment to see if they were able to even see that well, other times because the patient didn't know the alphabet. Twenty-eight people had eye examinations. 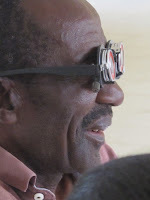 It was delightful to see the expressions on some when they were having their refraction done; the "glasses" were put on them with a set of interchangeable lenses in them and a newspaper was given them to read. Now for the amazing news! The surgeon happens to have been born in this village and was touched by the patients' situations. If we can provide transportation and pay the hospital fees, he will perform all of the surgeries at no cost. He can do batches of five per week. We need to make appointments at the Provincial Hospital and the waiting list is about one month. We do not have sufficient funding for all of the surgeries. However, we are scheduling the first five immediately and hope that we will see little Mary, and Lorna taken care of before we leave at the end of September. We believe we are to move ahead with all of the surgeries and trust for the finances to pay for them. Follow-up care and transportation will also be organized. THAT'S THE WAY LIFE IS! It is nearly impossible for us to wrap our heads around the fact that people have these kinds of maladies and they aren't treated. We have talked with Hesbone about it and he has explained it the best he can. But it is just mind-boggling to know that a person who is virtually blind, and has lived that way for years, can have sight restored: "Yes, Lorna can see with a simple cataract operation" per Dr. Richard - because that is the way life is; and to know that children with serious eye infections suffer so badly because that is just the way life is. 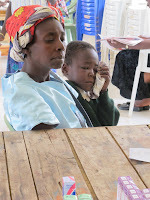 The vast majority of the people seen at the clinic can not afford the medicine, the cost of the surgery or even the cost of transportation into town. Some of the older ones don't have the simple skills or the physical ability to even get on and ride public transportation, let alone know how to get where they are going. For many village people if you get sick you suffer until it goes away, or you live with it, or you die. It is that simple! It isn't fatalistic - it is normal life! THAT IS JUST HARD TO GRASP - ISN'T IT? TRANSFORMING A COMMUNITY ONE PERSON AT A TIME! "Why bother?" You may ask that question. "There are so many of them!" you may say. We believe that clinic was in the right place at the right time. The Lord showed that He wanted to do this and we made ourselves available to Him to do it through all of you and through us. Lorna will end her life with more dignity than she has known for decades (due to her abusive background and loss of all of her children). Mary will not be blind in one eye and will have a greater opportunity to fulfill her destiny; had she not been seen right now it would have been too late to save her eye. 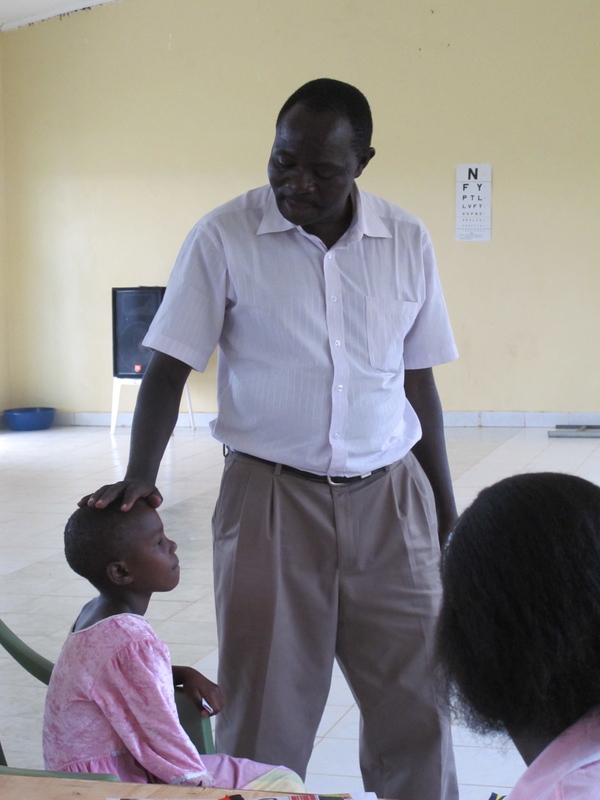 She has the opportunity for completing her education and, who knows, perhaps becoming an eye surgeon like Dr. Richard and return to her community to do what he has done. This was a designated time specifically for Mary. A boy's mother will not have to helplessly watch her son suffer terribly because now he has received a small bottle of eye drops. A few widows a year get a new "house" - some would have been dead by now had they not (one that we didn't get to visit last year did die). Many have disease-free water available to them for the first time ever. No! The numbers aren't large, but we hear over and over again that people know it is God that has made these things possible. They are changing from year to year because of what He is doing in their lives; either, directly or indirectly. People are being restored and transformed physically, mentally, emotionally and spiritually. We see women who were hopeless only last year, now laughing and actively involved in helping other women who are in hopelessness. We hear testimony after testimony from people wherever we go in this village and the area. Hundreds of lives are being touch in some way - literally. The Lord cared for John - one person, and he cared for Marty - one person. He invaded our lives and poured Himself and His love into us in every area of our lives. He does it one person at a time; so are we and so will we - so are you and so can you. ONE PERSON AT A TIME! The handkerchief is to absorb the secretions, he isn't crying. 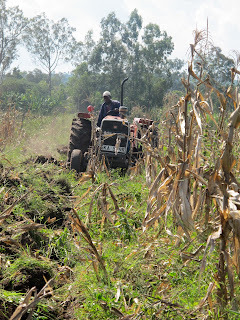 On Monday, 9 August, 1 ¼ acres was plowed (ploughed)* on the Widows Farm for the second crop of the year. The stalks and husks from the recent harvest were plowed (ploughed)* under to contribute to the nutrition of the soil. 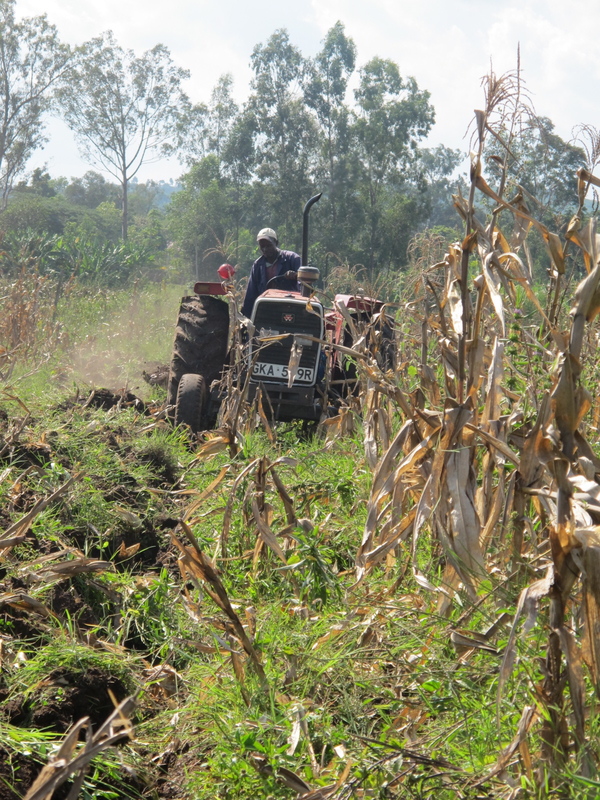 Next week the second plowing will happen, with a crop of maize to be planted shortly thereafter. There will probably be beans planted in the furrows between the maize; that way there will be a double crop to distribute to the widows. In Kenya there are two crops a year. One is watered by “the former rains” and one by “the latter rains”. There are two rainy seasons, one long one and one short one. Many people depend upon these rains for sustenance – if there is drought, the crops don’t grow and the people go hungry. The first crop is harvested in July, the second in December. We will also be planting sweet potatoes - this is another favourite staple crop. Food like beans, maize, sweet potatoes are great fillers for the stomach - besides tasting really good. Casaba is also grown and mixed with other food to stretch it (by itself it doesn't taste so great). Bananas - Jeremy, our friend from the UK who was here with us for two weeks, spoke to the folks at Emmanuel Christian Centre (ECC) about the fact that for £2 ($3)a banana bush (they are bushes, not trees) can be planted to help feed a widow. After church that day a little nine year old boy, named Chris, went up to John and gave him £2, saying he wanted to plant a banana bush for an old widow. We told him that we would plant a banana bush for him and take a photo to send back. When we inquired about the boy we found out that he isn’t from any family in the church, but comes to church with a friend. 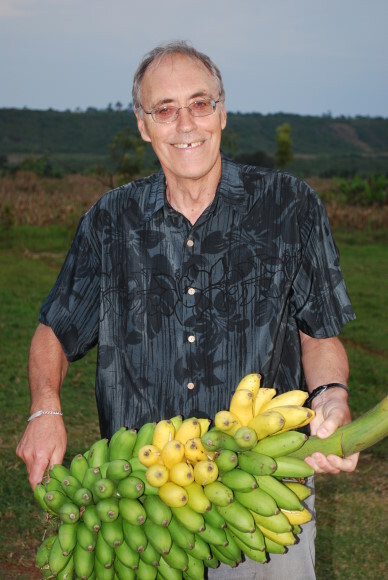 We have been given several pounds from people at ECC toward the start of the banana plantation, and Jeremy planted a bush for Chris and one for the church to begin the plantation. We plan to plant about 50. Another interesting fact about bananas is that they aren’t seasonal; the bush will produce continually. 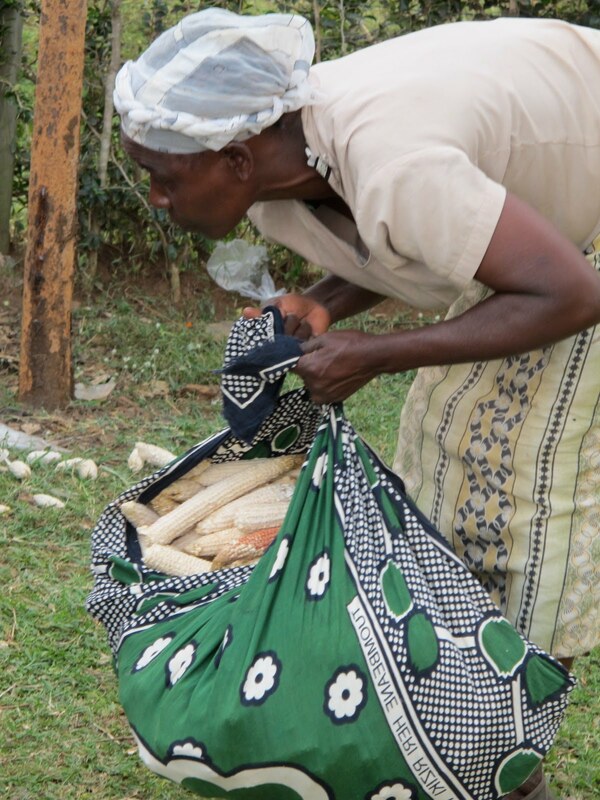 Bananas will be given to the widows and any access will be sold on their behalf and the money used for various needs. Above, Jeremy plants the sucker root in a mixture of dirt, cow dung, chicken manure and DROPPINGS FROM MIX (of Mega & Mix fame). The sticks have the various names of contributors to the banana plantation - including Chris'. John holds the promise of the future fruit that these specially developed hybrid plants will produce. SHALLOW WELL - We had a geologist out to the land to determine where to dig a shallow well for irrigation purposes. There is ample water not far down, and a well can be hand-dug; a small pump and portable generator will be used to get the water to a holding tank. It isn't drinking water and therefore the well doesn't need to be a deep-drilled borehole. We are getting estimates for the well project now. WILD ANIMAL STORIES - The next blog will share some stories about wold animals here in Kadawa and surrounding area. We didn't know there WERE any. Now about Mega & Mix – the first two goats ever bought and given away. In 2008 Mega Mix, the Sunday school class at Emmanuel Christian Centre (ECC) in Lichfield, England, decided they wanted to help us in our ministry in Kadawa. For one week they got money in various ways. Some fasted a meal and asked their parents for the money it cost for their meal, others did chores, some gave their allowance. We took the money with us and asked the Lord to show us what to do with it. That was when we first found out that a child could earn money from raising a goat – breeding it, selling the milk and offspring – and using the money for school fees, uniforms and books. Primary education is free, but they can’t go to school without those items. 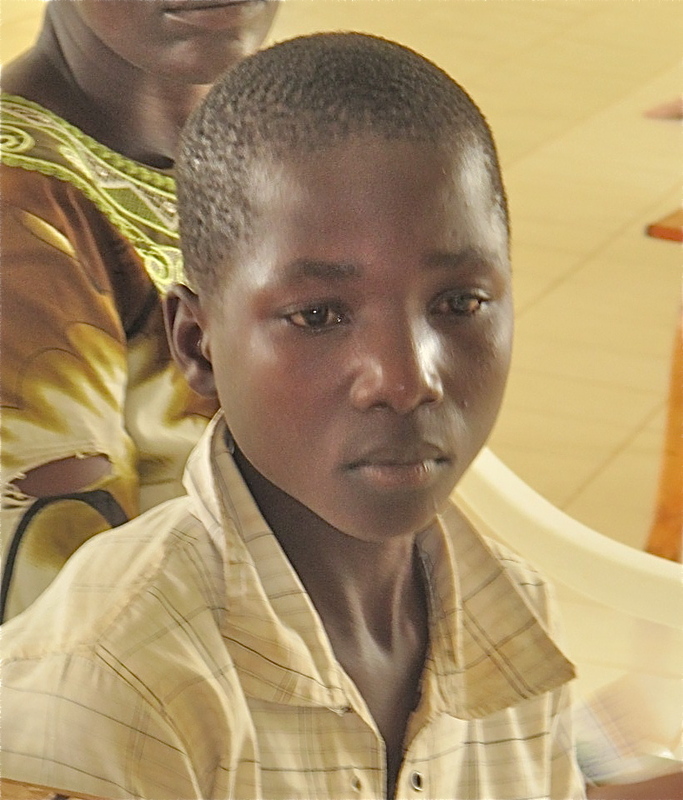 The first two goats went to boys who are not orphans, but whose families struggle to send their children to school. We added a few pounds (dollars) to what we received from the children, bought two goats and gave them to Meshach & David. We named them Mega and Mix. Before we came to Kenya this time Mega Mix asked us about the goats and we told them we would find out. So last week we stopped by Meshach’s house to see Mega. Much to our surprised delight there she was with twin babies – a male and female. Meshach’s parents had named one of the goats one day. Later they went out and when they returned Meshach informed them he had renamed it John and named the other Marty! We haven't seen Mix yet, but David's father tells us she is doing very well indeed. One friend back in the US says that these sets of twins are prophetic of the multiplication of and fruit of our ministry here in Kenya. We like that and accept that as fact! We are going to buy a "good" what the folks here call "he-goat" for breeding purposes. Hesbone is trying to develop a special breed of goat that will be highly sought after, and a "good" he-goat will facilitate that process. Therefore, the goats we give the children can benefit from this service, and the general public will pay a very good price for stud service for this “good” billy-goat and also when the offspring are taken to market they will fetch a higher price. We are thinking of giving it to the youth group at the church to raise. They have a patch of farm ground on the church property and are being given agricultural and horticultural training. We think that it would be a good micro-finance project for them. We are in the planning stages of how the stud fees would be used in ways other than what will be needed to feed and shelter the billy-goat. If you watch along the way you will see different vendors - including the coffin manufacturers. This is where one goes to buy one's coffin. Grave markers can also be found in the market along this road. Will tell you more in a couple of days. Jeremy planted the first banana bushes yesterday - photos will follow. Mosquito nets will be purchased soon. The mountain view and ridge view from where the house will eventually be on the Widows Farm. A river runs at the base of the ridge. We couldn't get to the Widows Farm to visit until Tuesday, the 3rd. When we got there we were able to see the fence and what the land looks like cleared of weeds and ant hills. Charles, who has been doing the clearing of all these things - including the ant hills - was in Marty's "prayer chapel" clearing it out for her. It will be a really wonderful place of solitude to which to go or have groups of ladies over for meetings in the out-of-doors. When we go to church this coming Sunday it should have been cleared of all the saplings in the middle, and perhaps the floor will have been leveled. John has also asked Charles to make a nice path from the fence entrance to the site. Here is the circle of trees from the outside and the inside - prior to the saplings being removed. Jeremy and Marty stood out on the land and were looking at the ridge in front of where the house will eventually be built and the mountain over to the left in the distance. A wonderful soft breeze began to blow and both had the sense of the gentle breath of God wafting across the land and all around them and also became aware of how very peaceful it was there. John commented on the same thing. It is a lovely place! Great news today! On Tuesday next, the field will be plowed for the second crop of maize. All of the stalks left from the recent harvest will be plowed under to enrich the soil. It will receive a second plowing in another two weeks from the first and then in a week or so the next crop of maize will be sown, and probably beans in between the rows. 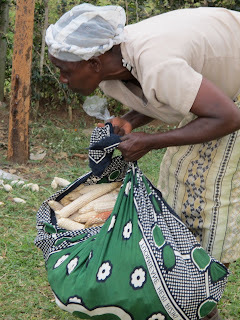 Maize and beans are the staple crops for the village people. Magwar is about 7 kilometers away from Kadawa. Originally people from there walked those 7 kilometers to church and back every Sunday, and the ladies also did so on Wednesdays for the women's meetings. Now Restoration Community Church (RCC) has a daughter church planted in Magwar and there are just short of 100 adults and about 40 children attending from the surrounding area - including a neighbouring village of the Luhya tribe. The church is about 18 months old. One member has donated land and they are now making and buying bricks - a few at a time - to build a church. Two big trees will soon be felled to make posts for a fence around the property. The video is a hoot and you will see what is quite normal for us out here. 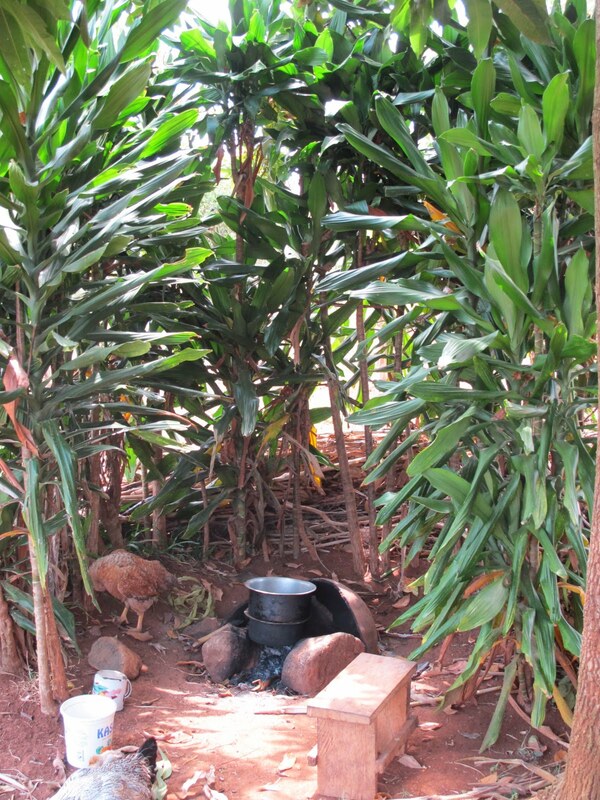 Dorcas' outdoor kitchen - she cooks on the floor in her house when it rains. 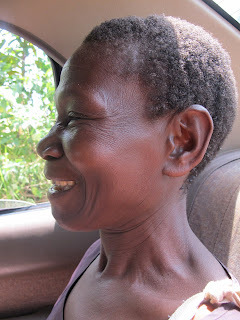 Above, Mary is riding with us to Dorcas' house. We will be sending more updates as we go along. We have news about Mega & Mix, the first two goats that were purchased with money saved by the Mega-Mix Sunday School class at Emmanuel Christian Centre, where we worship in the UK. That will be shared in the next episode. Our flights were smooth and on time! We were delighted to see many friends over the day and a half we spent in Nairobi. It was REALLY cold in Nairobi - we needed extra covers at night and had to wear a cardigan/sweater/jumper until about noon each day and the don it again at sundown. It was off to Kisumu and Kadawa on July 29th, where we spent 2 nights with missionary friends until our place was available. It is NOT cold here. Our friend, Jeremy Bell arrived from the UK for his first visit to Africa on the 31st (with jumper in hand - since he didn't need it here) and we got him settled in for the beginning of his adventure that he is experiencing along with us. Of course the power was off when he arrived and he didn't have any until Sunday evening. We got to Kadawa on Sunday morning for the first time since arriving! (We were late due to having to stop at the mechanic's on the way to have the car looked at. Seems that when it was washed the previous day, the engine was washed also and there was a lot of water in the spark plugs). Ohhhh! It was so good to be part of the worship and to meet with so many of our old friends and acquaintances. Jeremy lost count of the hands he shook - there were so many. All were so happy to meet him. Jeremy- sweater on arm- waiting for his luggage@ "Kisumu International Airport"! Since being at our compound internet service has been a bit erratic and that, along with being technically challenged and our busy schedule, has all contributed to not being able to update everyone until now. Jeremy is at a different location than we and he has been able to keep right on top of things on the internet and his blog. The maize on the 1 1/4 acres at the widows farm was harvested - in one day - on the 26th and it was piled in a storage room at the church waiting for us to "shell". It was a good harvest, although not as good as the second crop will be because it was planted in fallow ground that had no crops for many, many years. We are assured that the December crop will be really good. Additionally, there was one spot in the field that was very wet and the crop did not grow there. The field slopes gently downhill. There is one water management ditch at the top of the field, and another one will be dug - across the middle of the field - before the next crop is planted. When it rains, the ditches - approximately a metre in depth - will fill up, keeping the rain from carrying away the top soil, and from making the ground too wet in some areas. The water in the ditches will continue to irrigate the crops as it seeps down toward the river. On this past Monday morning a large group of widows - mostly middle-aged - came to the church to take the kernels off the cobs. We arranged for a big meal for them and when we arrived (late due to big-time car trouble) there were three fires going; one in the shed cooking what looked like maize or beans, one outside cooking the meat (think it was goat) which, after being fried, would have vegetables added to make a delicious stew, and the third making chai. We're not sure what else was had. We thought we would be eating with them, but we were in a meeting with the church leaders and missed the whole wonderful meal and camaraderie. We did have traditional chai, with bread and butter at the end of our meeting. This is a mandatory refreshment for any type of lengthy meeting or when visiting with people. However, prior to the meeting we had a wonderful time pushing the corn off the cob with our thumbs. When we arrived a group of ladies was sitting on the floor in the storage room, and the kitchen, surrounded with ears of corn, corn cobs, and a floor full of kernels. John stood by the door and Marty sat on the floor and they graciously kept tossing us ears of corn with a row or two already removed - with a knife - and then we just pushed the rows of corn off the cob with our thumbs. John and I have Glorious blisters on our thumbs - proudly worn badges of merit. Ordinarily the maize is then spread out on tarps to dry outside, but we needed to get it to another location, so it was bagged in large sacks for transport. Then it will be spread out to dry and sacked for storage and distribution. Hesbone reckoned it to be about 7, 90Kg. bagfuls. 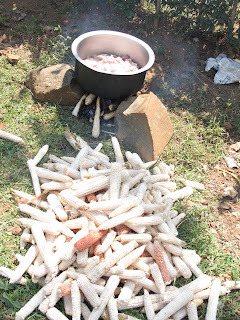 Nothing is wasted - the cobs are used as fuel for fire. Some were used for their meal there and the rest were carefully packaged, put on their heads and taken home. It will supplement their firewood supply, which must be foraged for every day (a job usually done by girls). The stalks in the field will be plowed under to help nourish the soil for the next crop. We will be keeping you up to date fairly regularly - so many things are happening to report and so many photos. More about the farm land in the next episode.